Another Saturday, another road trip to check out one of the ever expanding number of parkruns. For the laters adventure the GinRunners loaded up Mabel and headed to the Kingdom of Fife. 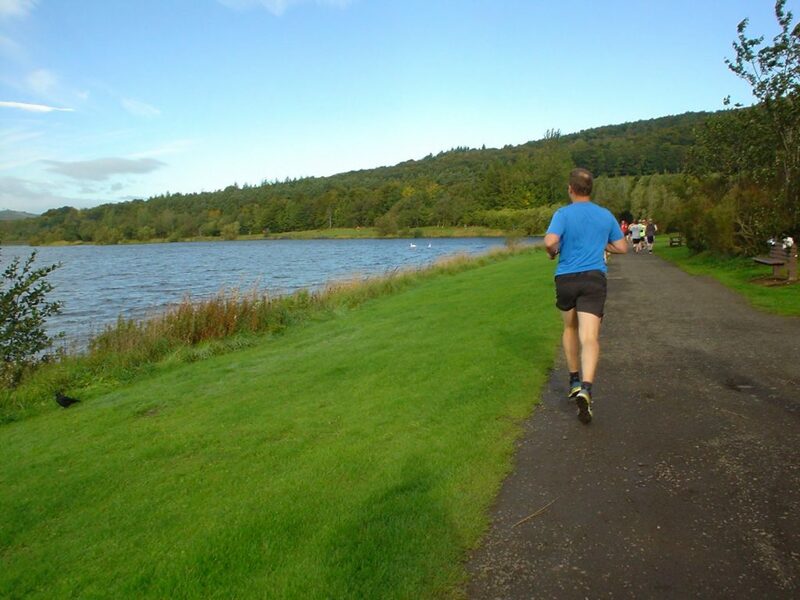 We headed over the Forth to sample the delights of the Lochore Meadows parkrun. Or, as it’s known locally, the Meedies. The Saturday weather started off what we refer to as “a bit pish” but by the time we’d got over the Queensferry Crossing the sun was shining and there was some definitely blue sky on offer. We headed through Lochgelly and followed the signs for Lochore with the usual “I hope the start isn’t too hard to find” concerns. 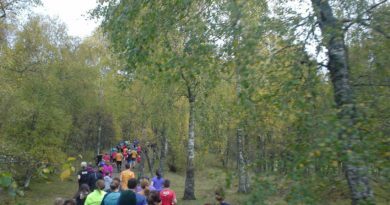 We needn’t have worried, there were loads of runners about, and we joined them congregating around the new (apparently) cafe / visitor centre. Luckily this congregation didn’t last long as it was a bit chilly and we were keen to get off. Especially as neither of us had remembered our long sleeved tops. 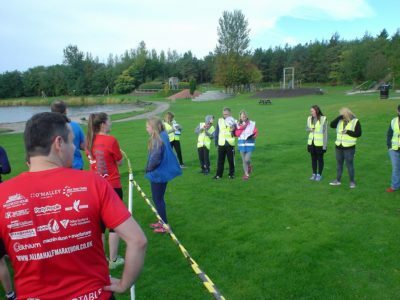 We always enjoy the traditional parkrun welcome talk from the race director. It’s always nice to give a round of applause to people celebrating their 50th and 100th parkrun milestones. Especially for those of us who are on their *ahem* 8th. We quickly settled into a rhythm, only to be overtaken by a boy who was going great guns. As he seemed to know where we were going we slotted in behind and plodded on waiting for him to tire and get out the way. 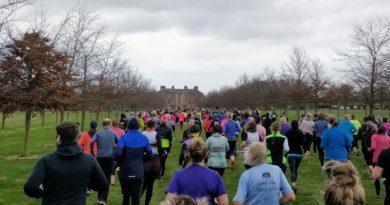 This is a pretty parkrun. You can just see the race leader.. a small red dot in the distance. We followed the shore of the lake pretty closely, only cutting inland for a small loop about half way round which we were just getting to as the leader was leaving. It was the closes we’ve been to the leaders in a parkrun. After a flat first half there are some gentle inclines as you get to the 3K mark but nothing too horrible. The locals seemed friendly enough too, greeting us with a smile or a cheery wag of the tail depending on species. 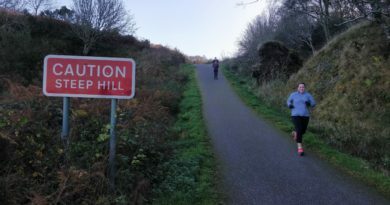 The course was “gently undulating’ by this point but again nothing too serious and it flattened out by about the start of the 5th KM with a nice downhill bit to set you up for a good finish. Even the ducks looked impressed. By the time we were in the last Km the aforementioned small boy was charging away. Of course we ordered our legs to go faster… we’re not being beaten by a child!!! Our legs told us to bugger off. The wee dude was off and we had NO chance of catching him. After we finished and had our barcodes scanned we headed for home. 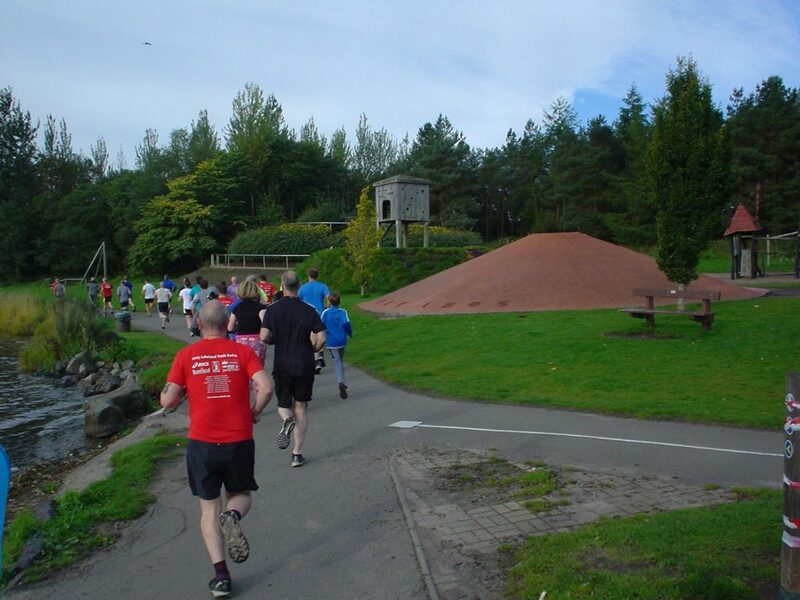 We’d thoroughly enjoyed our visit to pretty Lochore Meadows parkrun. It may lack the “mountain factor” of Fort William, but it wins the “scenic loch” prize hands down. And it had more swans. The Meedies has it all, a great route, great people and a proper “friendly” feel. It’s another one well worth checking out if you’re ever in the area.